Mariah Carey was performing her hit song, Make It Happen, on stage in Singapore when she tumbled over like a ton of bricks. Instead of stopping the show, she got the assistance of her backup dancer in helping her to her feet and went on with the show — barefoot! Isn’t it nice to have people fawn all over you at your every beckon call? And you can totally tell she’s pregnant in the video. She’s not covering it up as well anymore. She should just go public with it already and embrace it! What do you think? 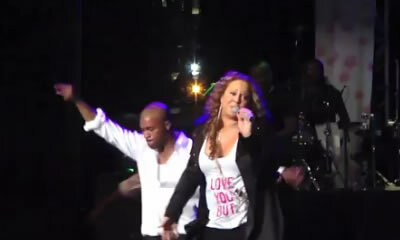 Mariah Carey Battles Stairs in Louboutin Shoes & A Not So Yummy Tummy!